As more archival material is discovered about the equipment in the 2nd Wireless Office, a picture is beginning to emerge of what was there during HAIDA's WWII days. 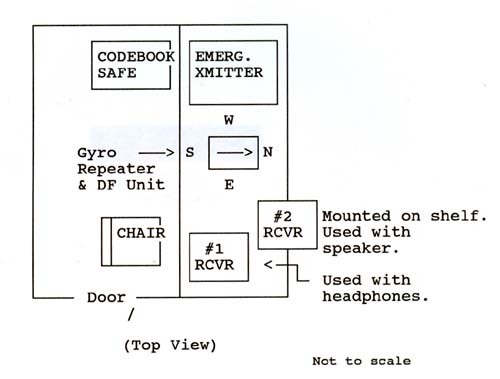 In reference to the CDC and CBB items, a footnote on the original document indicates these were receivers. CDC were Admiralty B-28's (CR100/4 series) and were bench mounted. CBB was the Admiralty B19 and it was rack mounted. In parenthesis, is the type of power supply used with the receiver. This 1943 equipment fitting was drawn from memory by Frank Dobson of Wolfville, N.S in July of 1994. 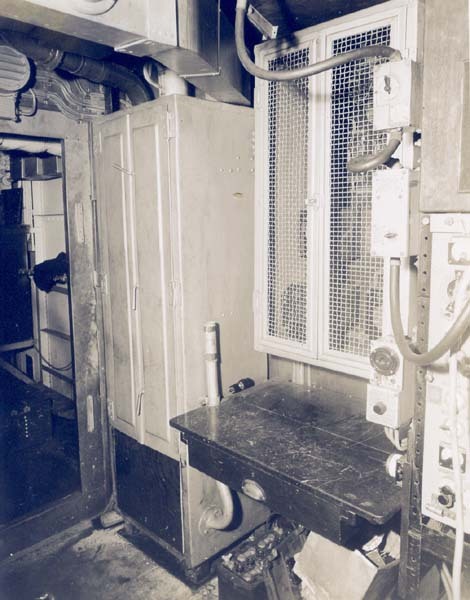 As-built, HAIDA's HFDF birdcage antenna was located atop the mainmast but later moved to inside the 'new' foremas during the September/ December 1944 refit. The DF unit in the drawing would be DF outfit FH-3. Because the drawing is from memory, it may not be accurate. Frank provides some additional details about direction finding. 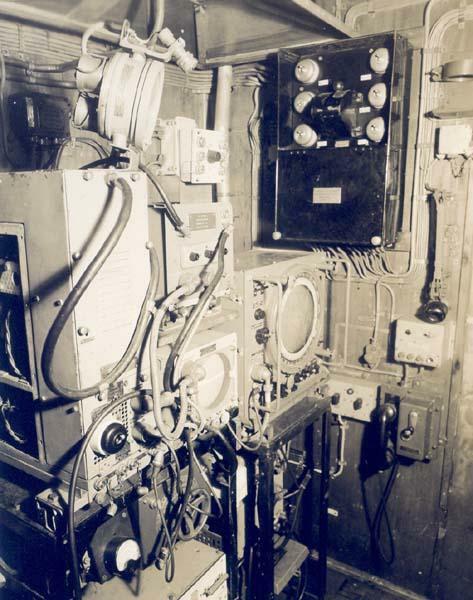 "When the U-boat started to send its sighting report, we had to quickly transpose the frequency from the intercept receiver into the HFDF receiver. Correction curves were applied to correct the gyro reading and get a true bearing on the sub. The ship was calibrated in harbour and Bearing Correction curves produced for the known German frequencies. There were big variations between the various frequencies and at some points of the compass, the true bearing of the transmitting vessel would be off by and much as 20 to 30 degrees". 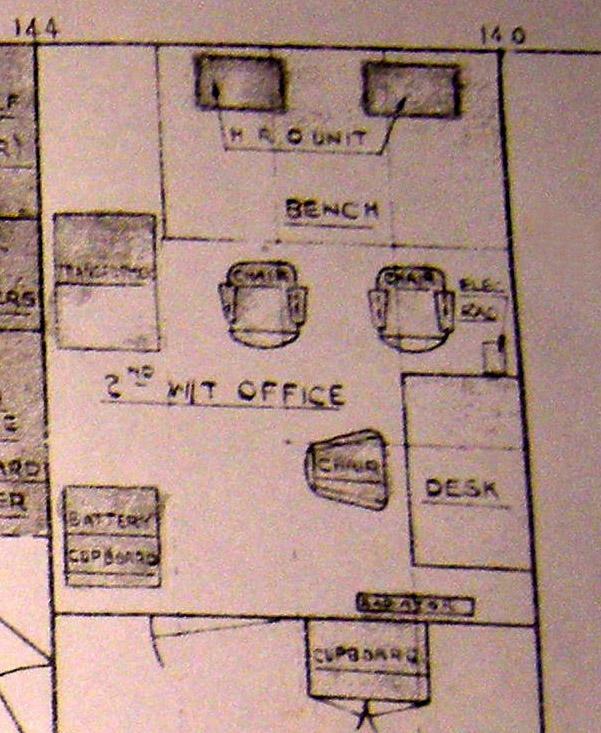 Fred Jones , who served in HMS Tartar, provides some additional information on Ashanti's 2nd Wireless Office. "The Silent Compartment contained, in my time, the Typex coding machine and instant communications to the Bridge and Captain. 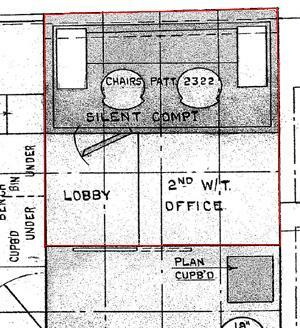 Soundproofing was installed, to avoid disturbing the staff within, and also for further separation from the top secret work being carried on within. The R.N. was very secretive , even amongst the crew about the existence of this communications system. As always, information t was provided on a need-to-know basis. During my time at the R.N. Signal School, we took many notes of all the systems and equipment we had to maintain, but at the end of the courses, all this paper was burnt, under supervision. It was still in our heads, obviously, as we had to keep it working". During the September/December 1944 refit, the DF outfit was moved forward, the 291M radar antenna was moved from the foremast to the mainmast and the 291M equipment moved into the 2nd Wireless Office. 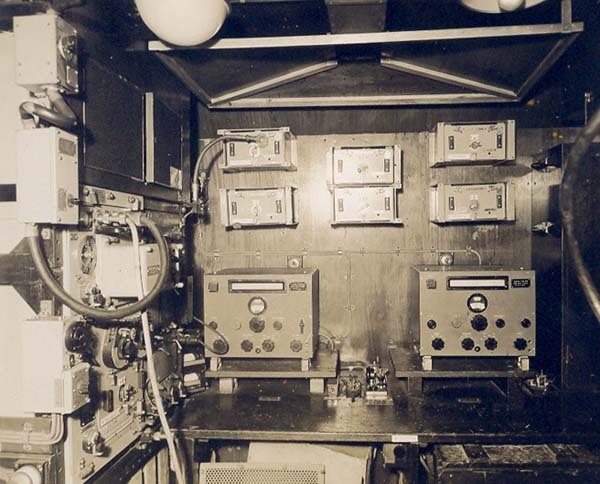 2nd W/T Office - on forward bulkhead (left side): 291M transmitter; 291M receiver; 291 indicator; aerial control under indicator, power supply board for outfit DUF (under aerial control); PPI; 242 IFF modulator, mixer, transmitter, IFF responser below PPI. Type 291 was the final British 214 MHz (P-Band) small ship, air search radar that was introduced in 1942. Early versions of this set required separate transmitting and receiving antennas, but a TR (transmit/ receive) box was soon developed. The 291 antenna had a beam width of 40 degrees and was of the lazy 'H' construction. Power output was 100 kilowatts at a pulse length of 1.1 microseconds. It had the capability of detecting a bomber at 15 nm. Unless otherwise noted, the RCN photos in the this table came from the collection of the late John Rouey of Ottawa.